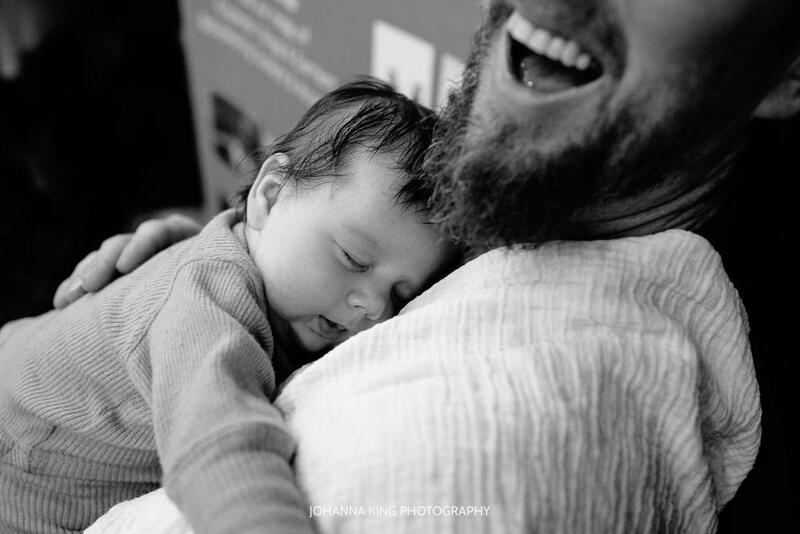 ​From January 2019 Je Porte Mon Bebe becomes Love Radius! Fidella FlyClickThe FlyClick combines the benefits of our Fidella Fly Tai with the simplicity of our Fidella Fusion. 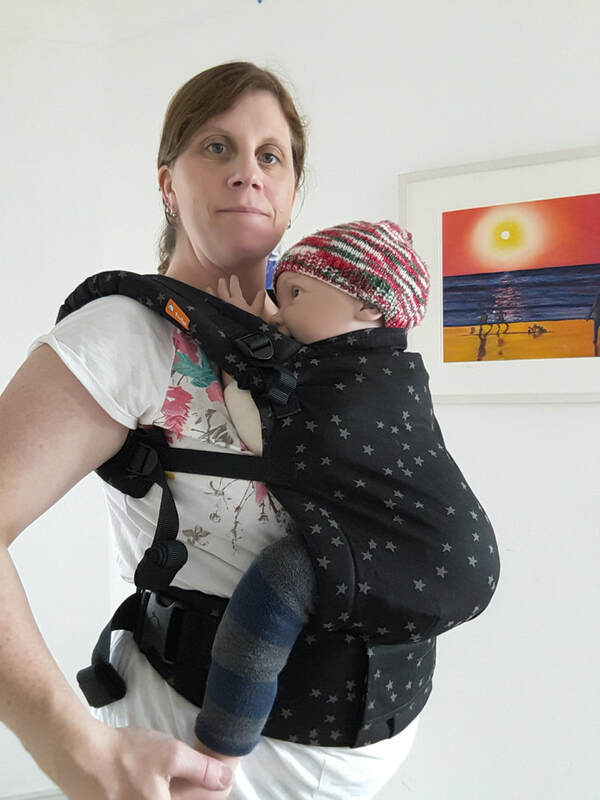 Lightweight & flexible, just perfect for everyday use! 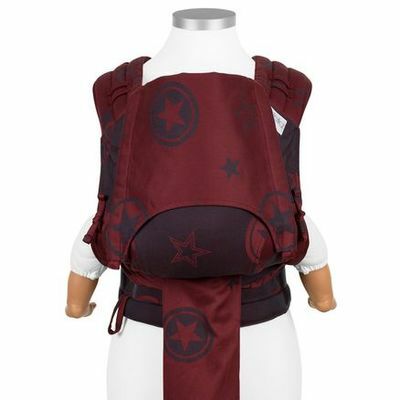 The baby carrier has padded shoulder straps, which lie comfortably on the shoulders. 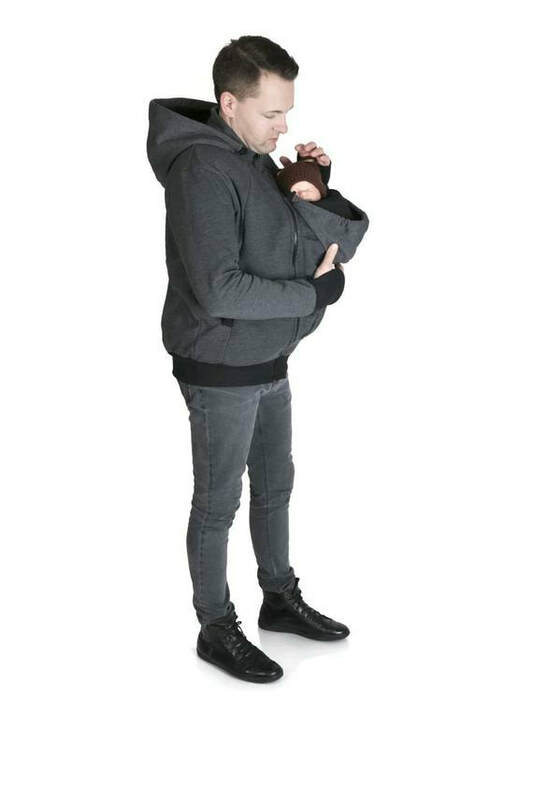 They can also fan out and distribute optimally the weight of your child. 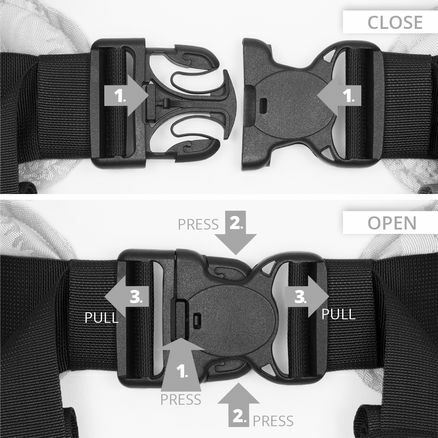 The waist belt is closed with a safety buckle. 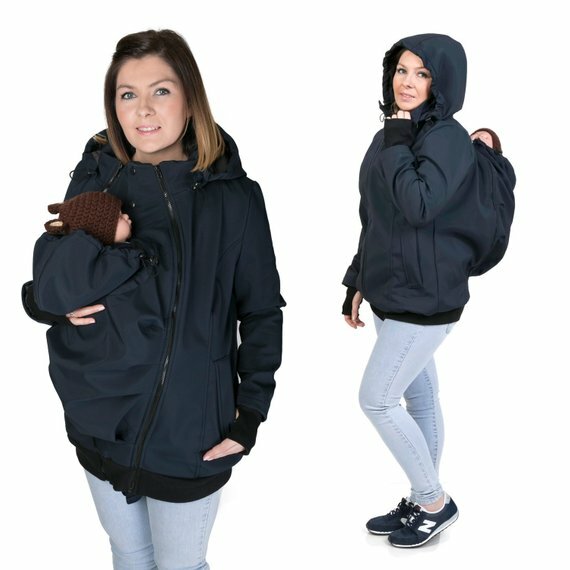 You can carry your baby on front, on your back or on your hip. 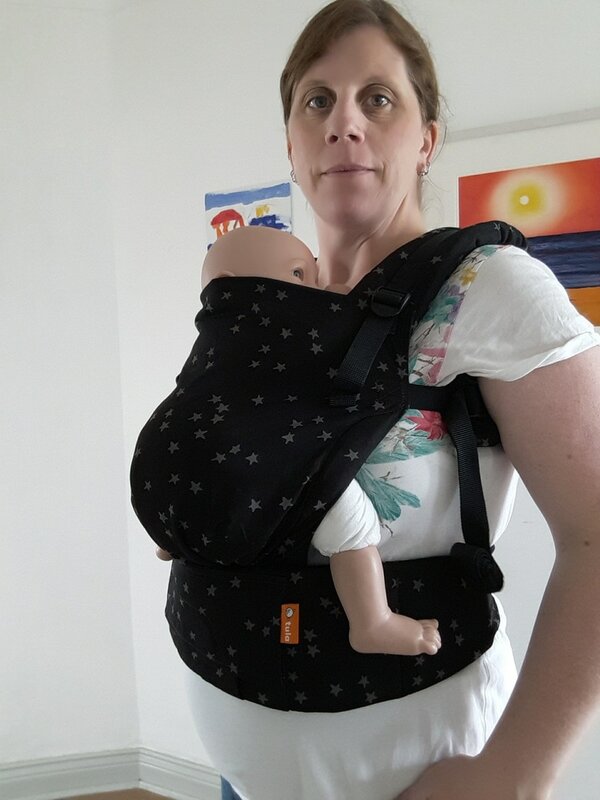 The Fidella FlyClick can be used from birth through the first twelve months. Please note that we are initially only offering the Fidella® FlyClick for the European market. Sales to the US and other overseas countries will follow soon. There is also Fidella® FlyClick Plus which can be used from 9 months to approx 3.5 years. The order will be arriving next week so we'll get a chance to give it a good go then! So this is how we've managed to go out and about this winter. 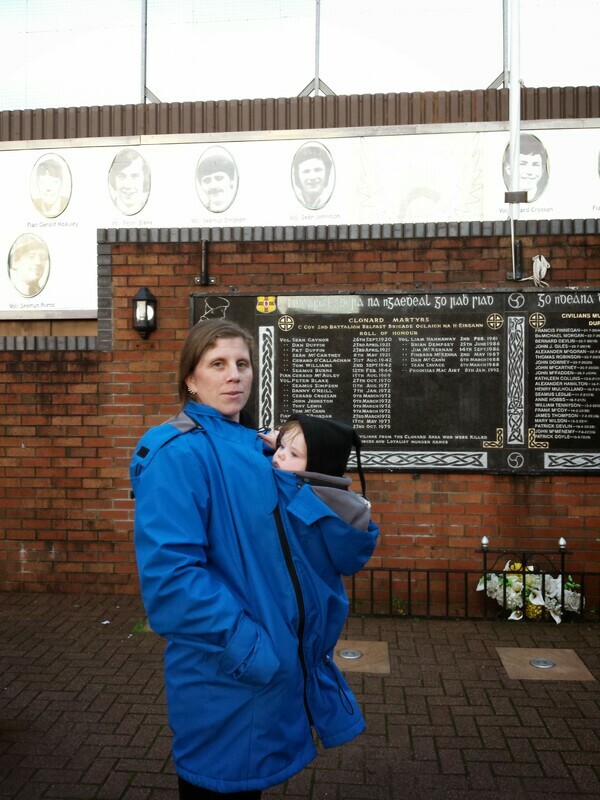 This particular day, it was 6 deg outside and it was a dry, cold day. I dressed little miss in her normal indoor clothes - a vest and babygro and she was wearing a LennyLamb baby hood and fleece lined booties to keep snug. 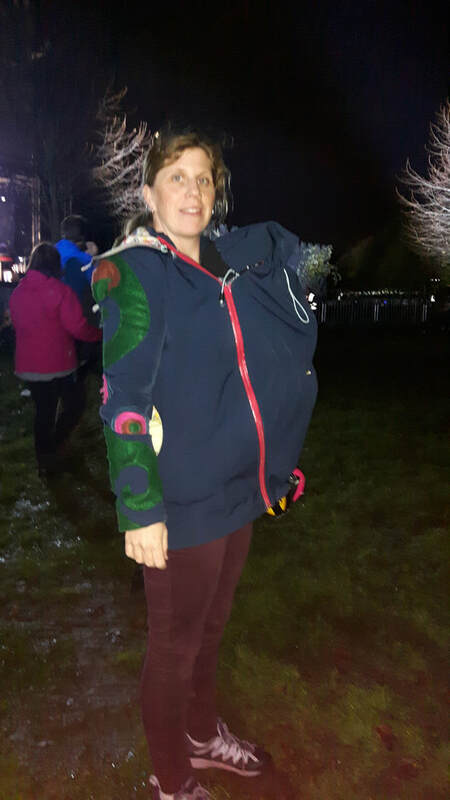 The woven wrap gave her another layer over her torso to keep her warm and the waterproof babywearing jacket kept us both snug and warm together. 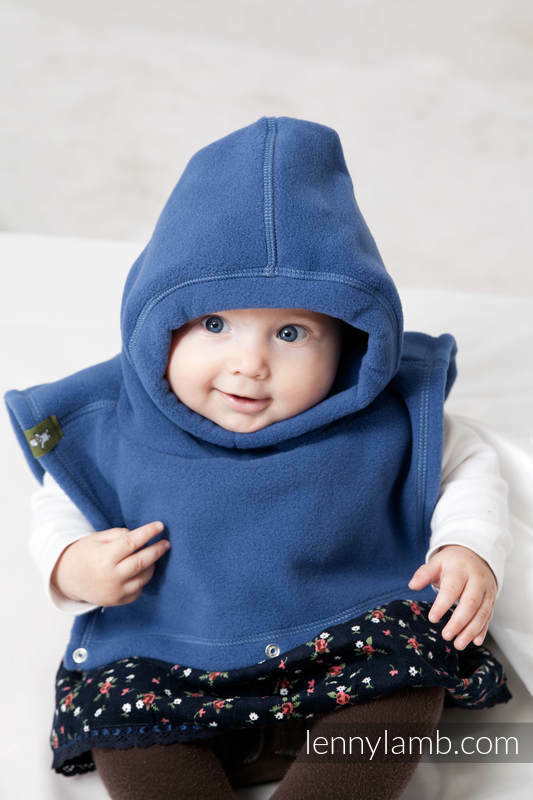 I had a fleece turtleneck from LennyLamb and a wooly hat to keep myself warm too. 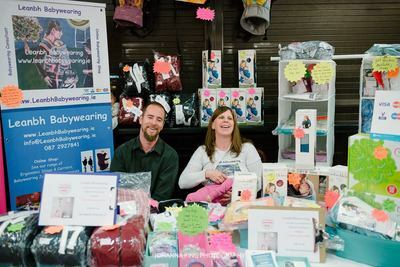 What a day at Wear A Hug Fair! What a great day at the Wear A Hug Fair. Not only was it my birthday but I got to spend the day surrounded by slings, talking about slings, looking at slings. 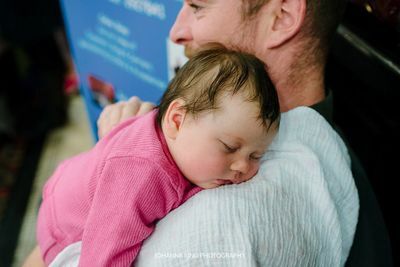 My husband and our littlest came with me to help on the day. I couldn't have managed without him! 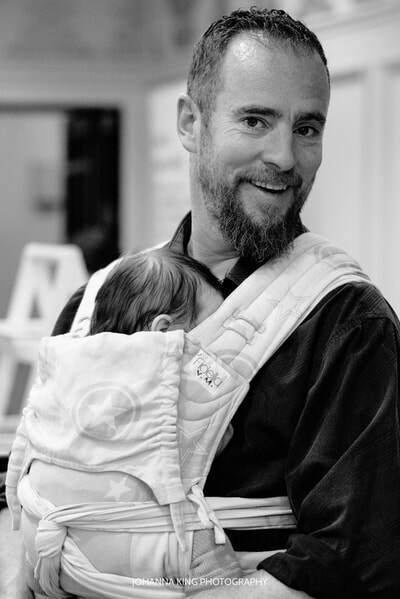 And he did a great job with our little one, modelling slings for the day! I came away from the fair already looking forward to next year. There's such a buzz at the fair and there's just something special about having the whole place filled with families and slings. I was delighted that Johanna of Johanna King Photography & Films took some snaps of us on the day. Have a look at her website to see some more of her work and to arrange a photo shoot for your family. 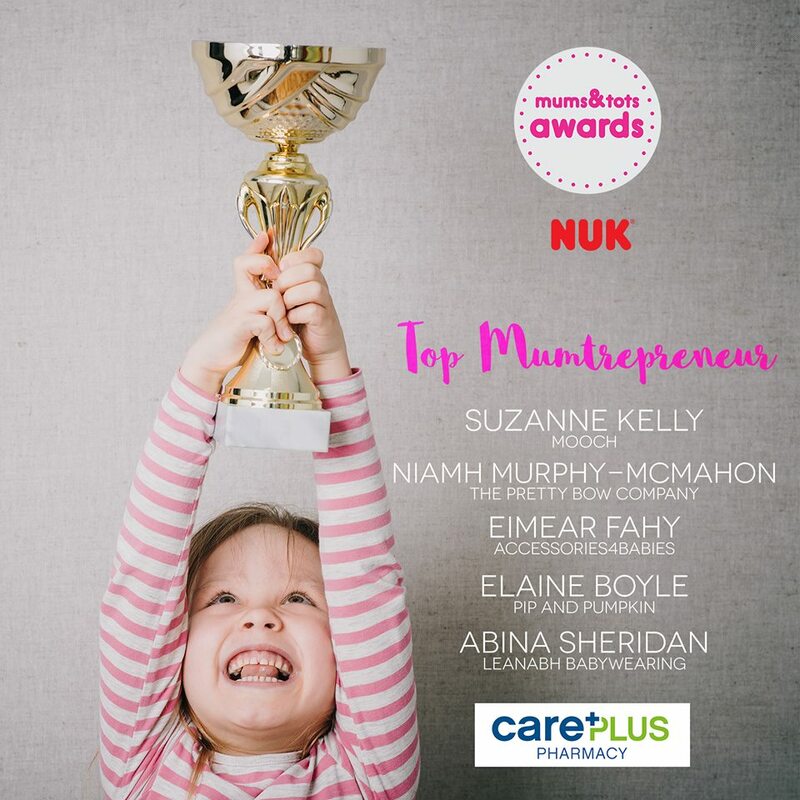 Woke up this morning to the news that I have been nominated for a Mums & Tots Top Mumtrepreneur Award!!! A huge thank you for the nomination and thanks to all that have voted so far. 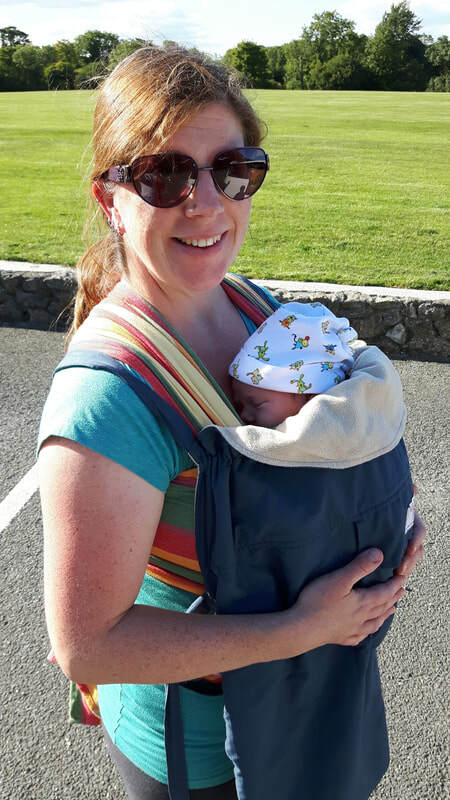 So, I'm now officially on Maternity Leave and *not so* patiently awaiting the arrival of baby no 5. 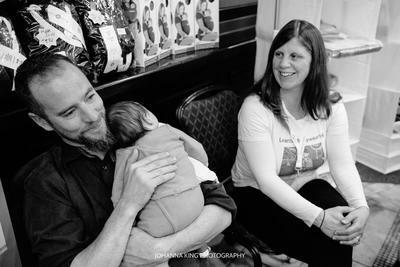 One to one babywearing consultations and group demos are now on hold for the next while but the sling hire service and online shop are business as usual. 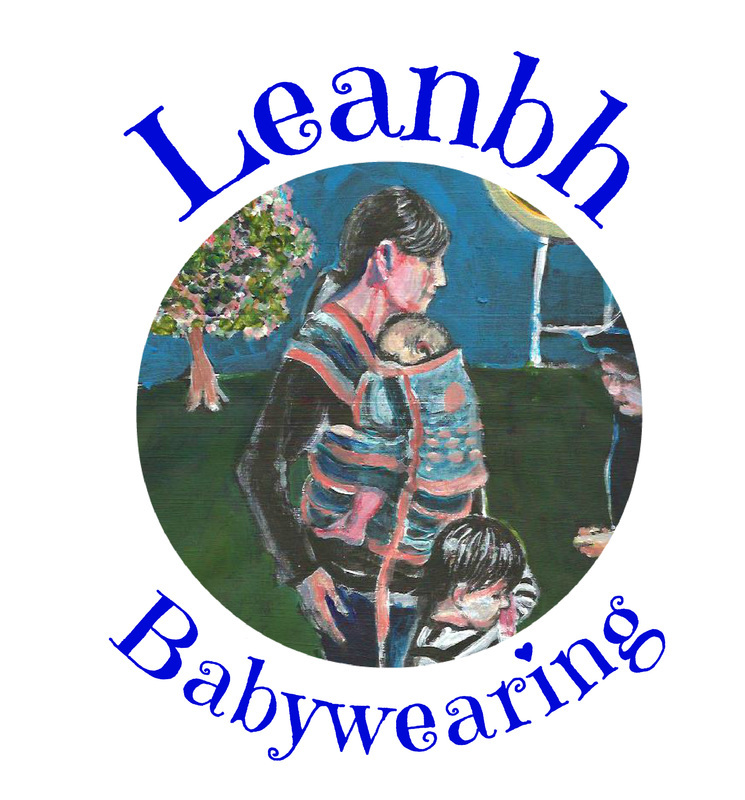 As always, I'm available to all my clients for any questions you may have following a babywearing consultation, so please feel free to get in touch by email info@leanbhbabywearing.ie. 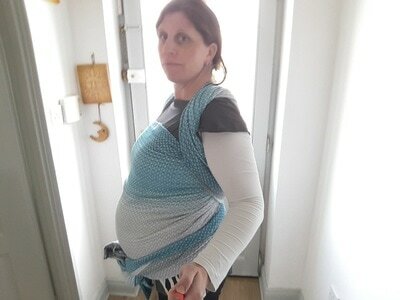 In preparation for our newest arrival, I've washed and ironed the slings I'll be bringing with me and have finally finished packing the hospital bag. 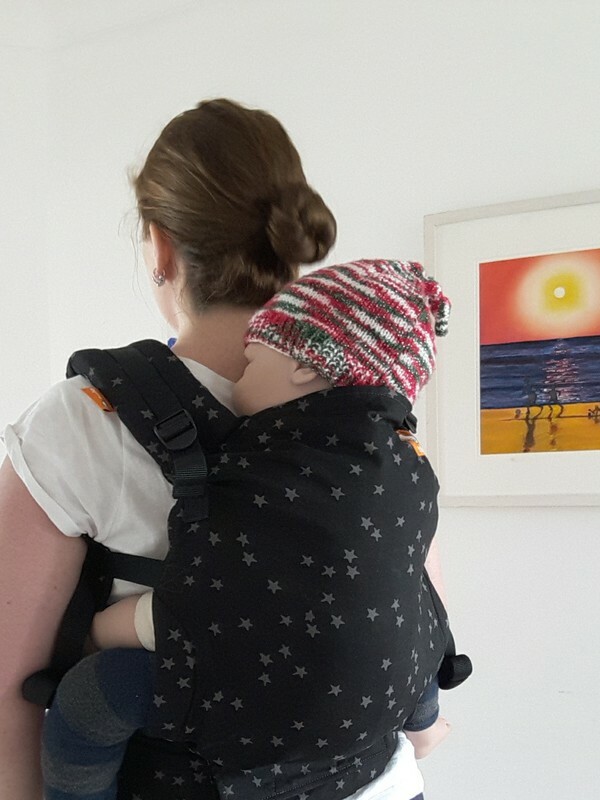 Wrapsody Hybrid Stretch (Green) - this wrap comes packed with memories for us as three of our babies have already been carried in this so far over the past 10yrs since I bought it. It's very light to wear compared to some of the thicker, heavier stretchy wraps but what's really great about it is that as it's a hybrid, it can be used for front, back and hip carries and can be worn in a front wrap cross carry aswell as a pocket wrap cross carry, so can be lovely and light to wear especially in the warm settings of a hospital. 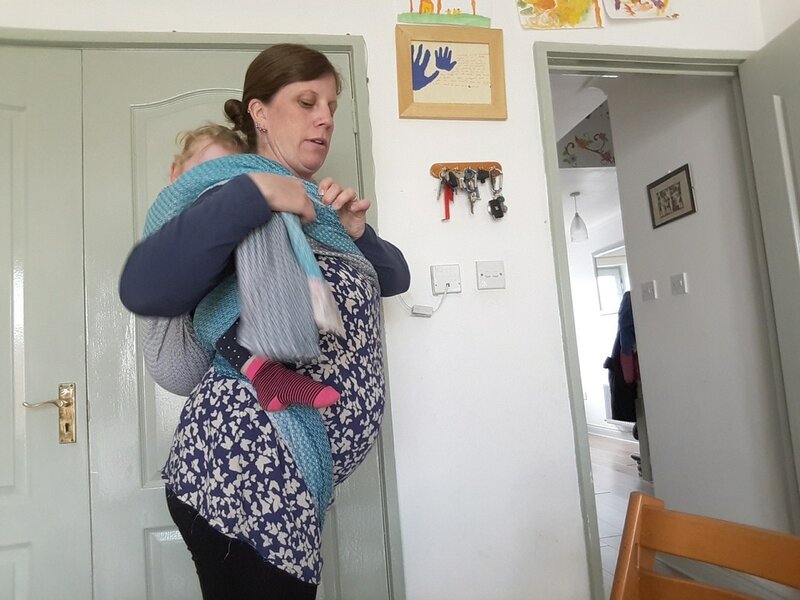 JPMBB Little Wrap Without a Knot (Lavender & Brown) - this ring sling has a bit of stretch and bounce and is perfect for a new baby. 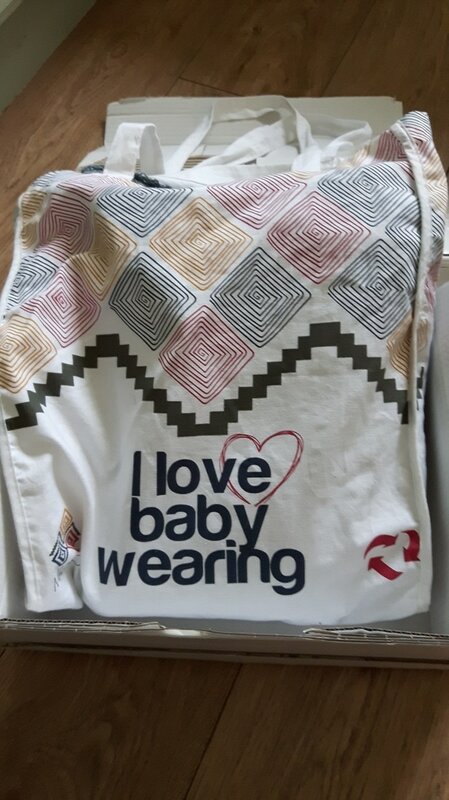 With only one layer of material over baby, it'll keep us both nice and cool. Lenny Lamb Woven Wrap Size 6 (Rainbow) - this bamboo/cotton mix wrap is lovely and soft and wraps a newborn really nicely. 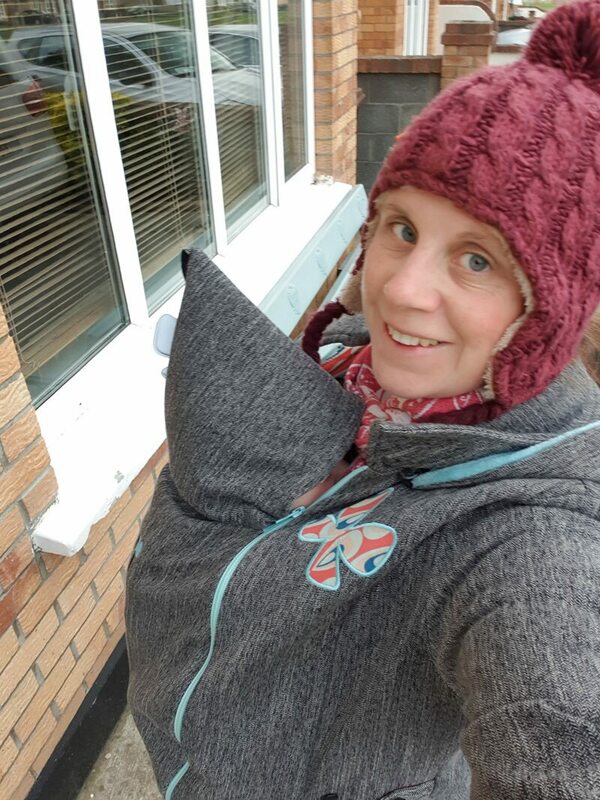 It's also a lightweight option for warmer days so perfect for the warm hospital setting. I'm looking forward to using this in front wrap cross carry with a twist and for kangaroo carry. I look forward to posting actual action shots in a couple of weeks. It's lovely to be able to have baby tucked inside a stretchy wrap for skin to skin, especially in those early hours and days in the hospital and the wrap will keep you fully covered at the same time, not to mention the handiness of being able to get up and move about or even to use the bathroom without having to disturb the little cherub. 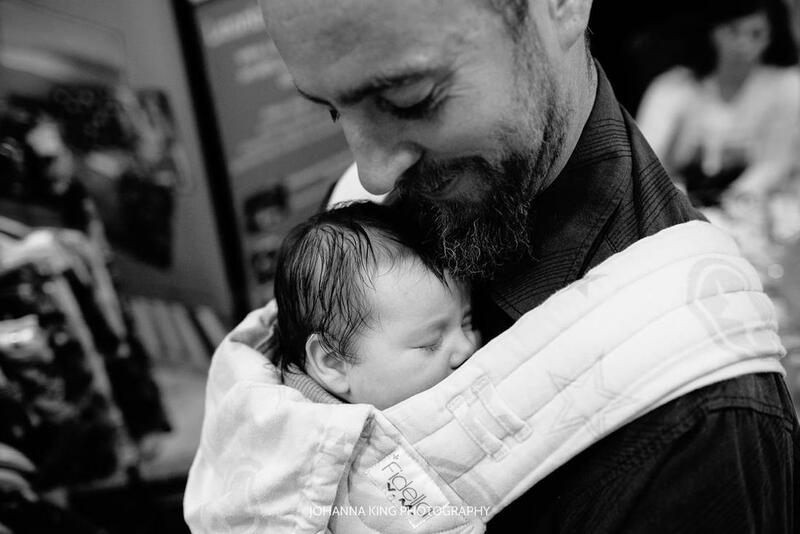 Daddies can also use the stretchy wrap for skin to skin which is a lovely way for daddy and baby to get to know each other and keep little one warm and close at the same time. Maternity cloth pads and bamboo breastpads. 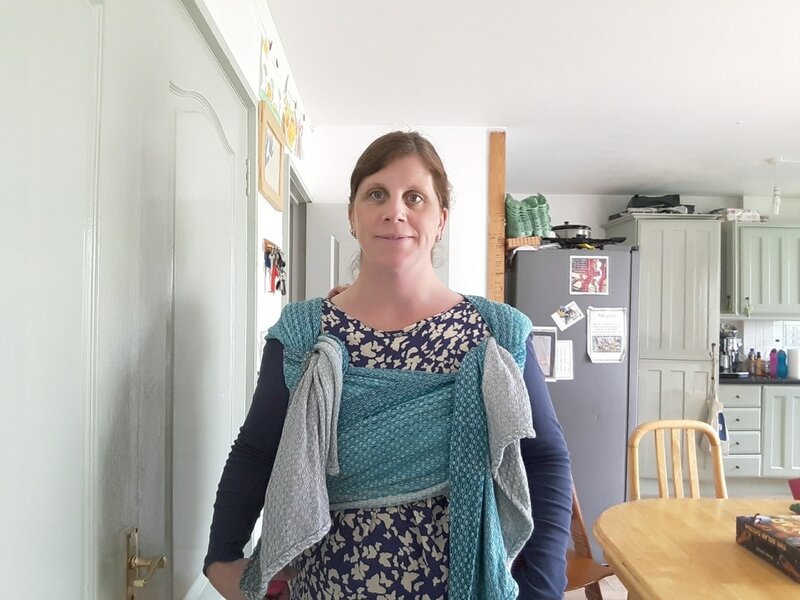 Mama fluff - I had been using a menstrual cup, reusable tampons and sea sponges for a year before becoming pregnant and so I decided that this time I'd also use mama cloth post partum. I managed to get a good deal from Cheeky Wipes during Real Nappy Week and so this lot of washable post partum pads along with with some normal day time pads and some back up Natracare Maternity Pads from Earthmother which are biodegradeable will do me over the next few weeks. Cord Tie - I've gotten a beautiful cord tie from Crochet by Orla which will be used in place of the hospital issue plastic cord tie - action photos will follow once baby has arrived! Cloth Nappies - this will be our 4th baby in cloth. 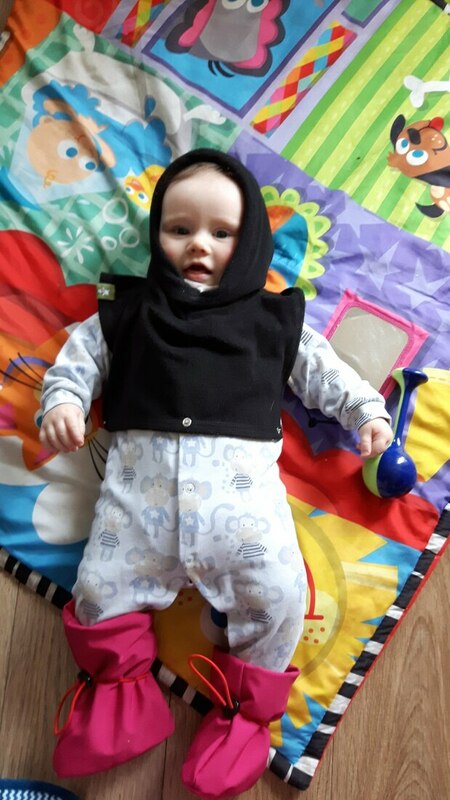 Baby No1 was in Moltex Eco Disposables back in 1996 when he was a baby. 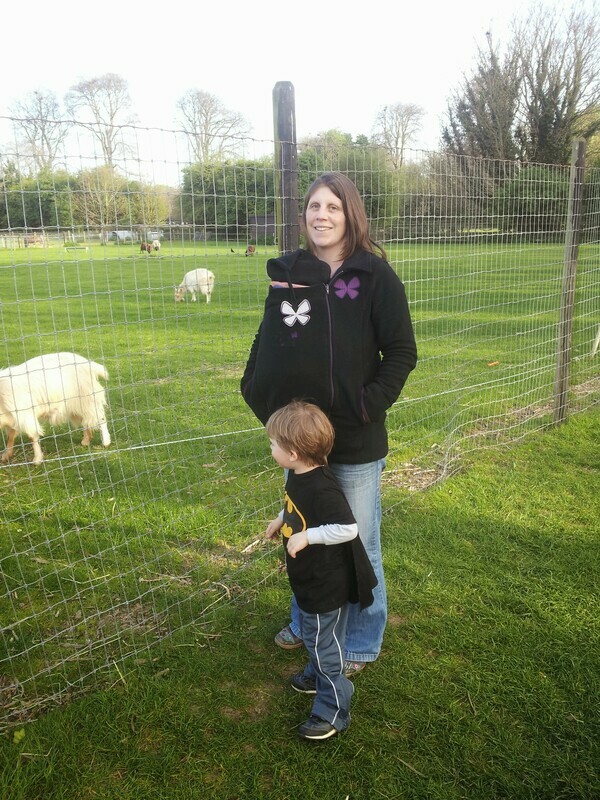 I ventured into cloth 10yrs ago with baby no 2 and the same stash will do us again this time around. Except for a few newborn nappies that I purchased second hand, everything else was stored in the attic awaiting a new bum. 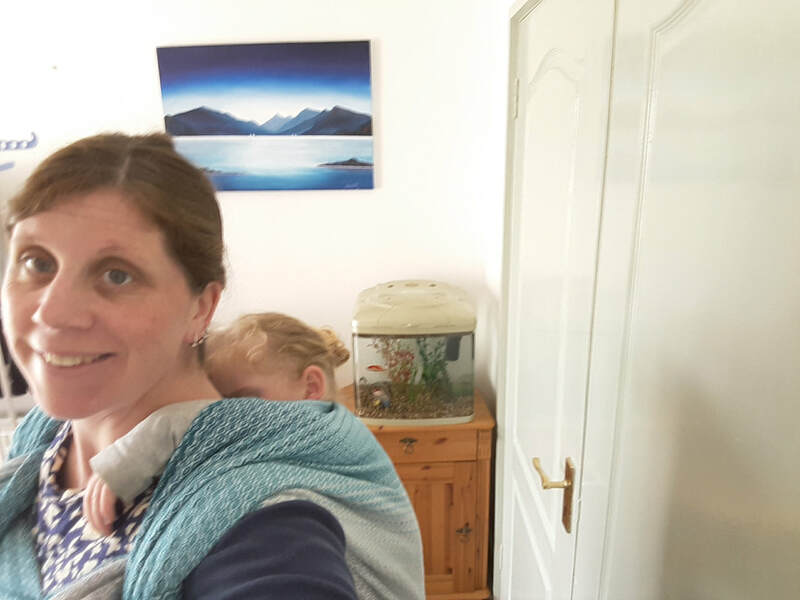 I have everything I need from cloth nappies to cloth wipes and wet bags all ready to go! 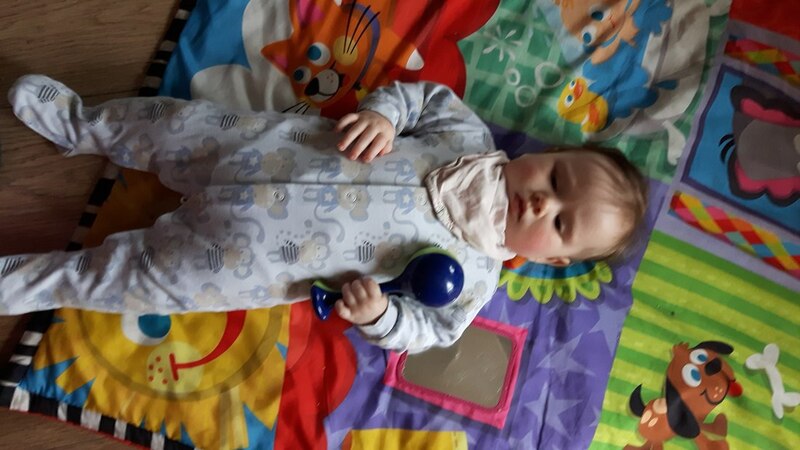 If you're interested in checking out cloth nappies, contact Cloth Nappy Library Ireland for some info & to arrange a cloth nappy trial! 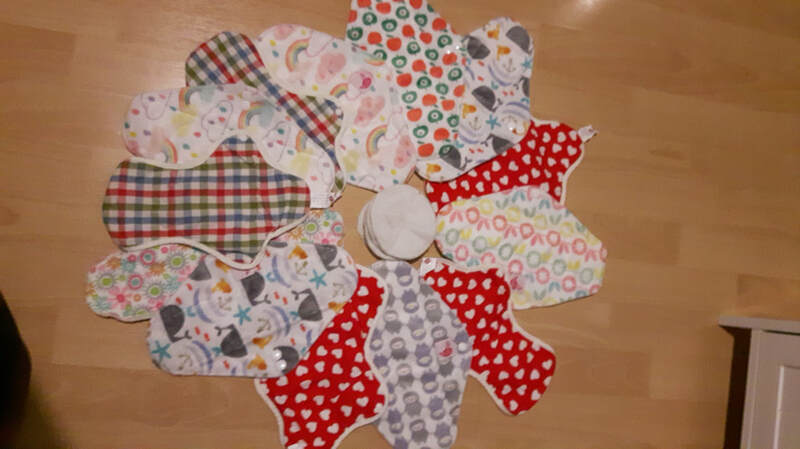 Breastpads - these bamboo breastpads were bought in 2010 on baby no 3 and are washed and ready for use again for their 3rd baby! 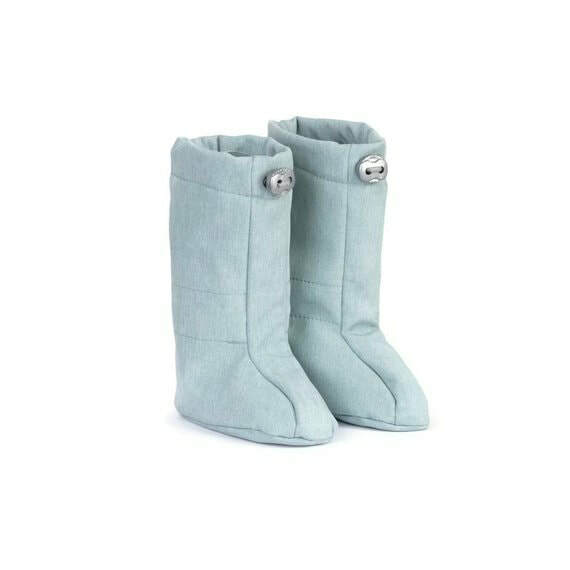 They can be washed in with normal clothes and using lanolin creams doesn't effect them at all. 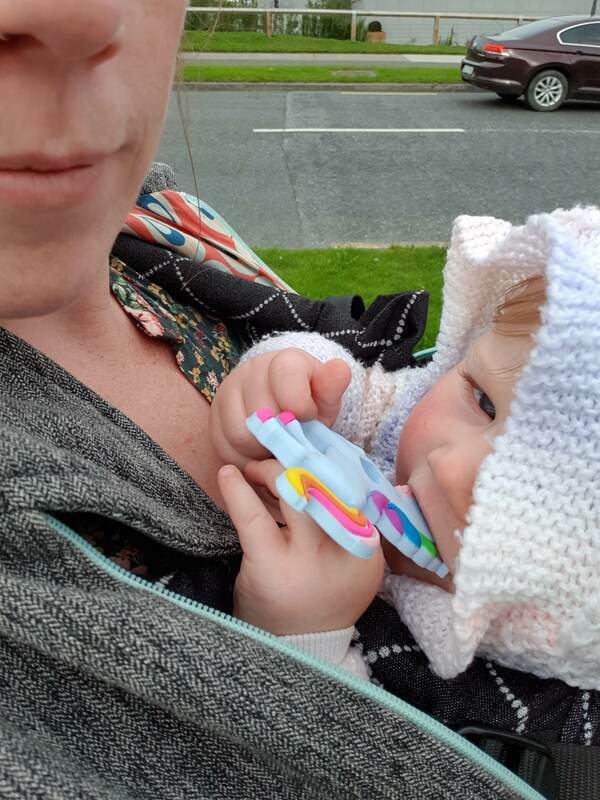 I found these so much better than disposable breastpads and the fact that I'm gettting a 3rd use out of them says it all really! Newborn size cloth nappies and wet bags. Spotty wet bag at the top of the case is holding cloth wipes. Hopefully we won't be left waiting too long to meet this little one and I'll be spamming you all with some precious newbie sling pics. 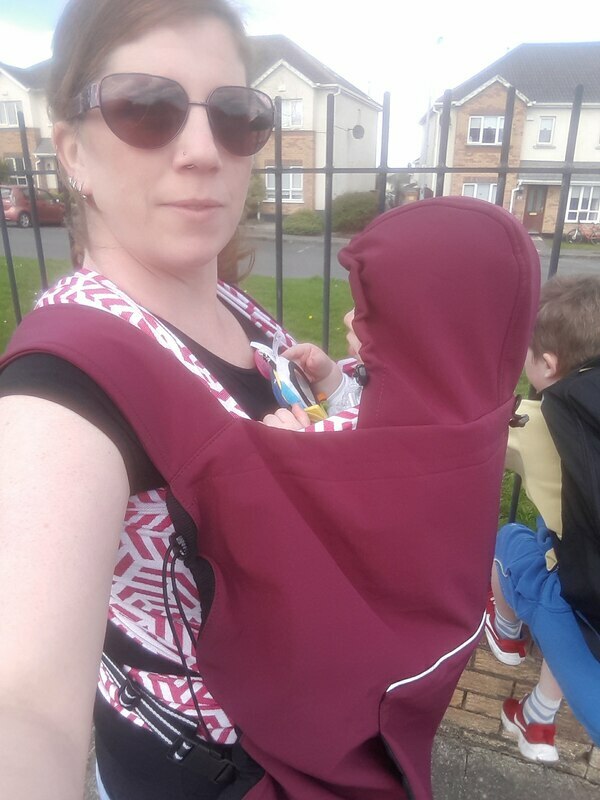 Enjoy your summer and have lots of lovely babywearing adventures while you can! I was delighted to help co-ordinate this beautiful Madalo Handwoven Wrap on it's travels around Ireland! 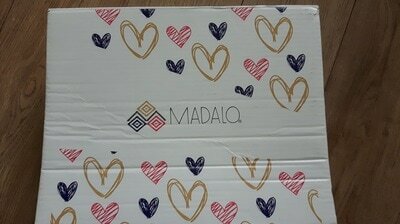 Madalo is run by Yuridia from Mexico & Christoph from Germany. Together, they decided to offer handwoven wraps from Mexico to customers in Europe. 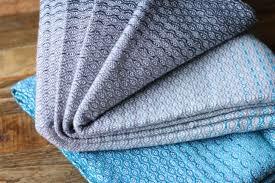 These wraps are fair-trade, ​OEKO-TEX® 100 certified and handwoven on traditional looms with passion and love! 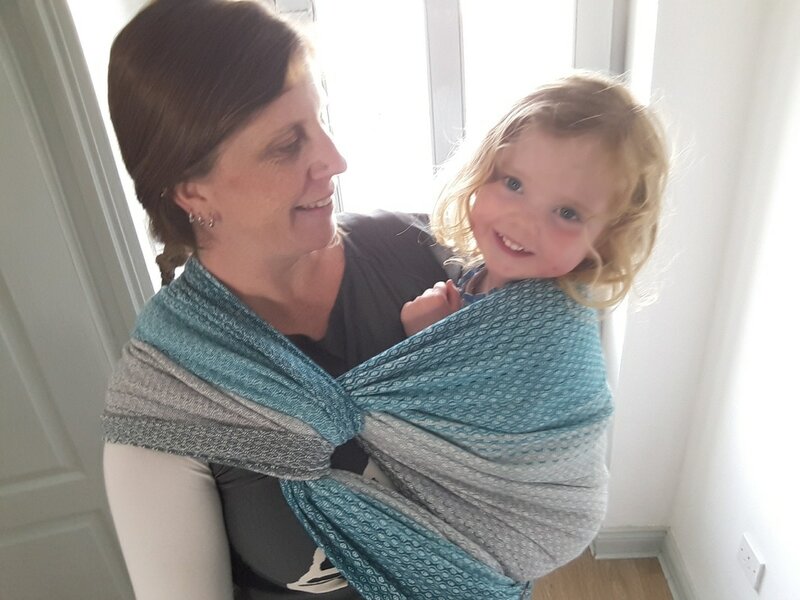 The wrap I've had the pleasure of trying out is Madalo Grasias Blanco, woven in Two Eyes Diamond Twill. 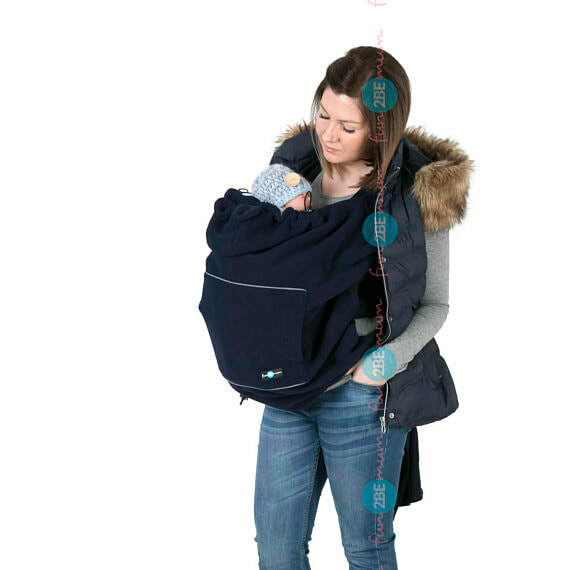 With a weight of 300gsm, this wrap is most definitely toddler-worthy. The wrap was well packaged, delivered in a large heavy duty Madalo box, presented in a cloth bag. 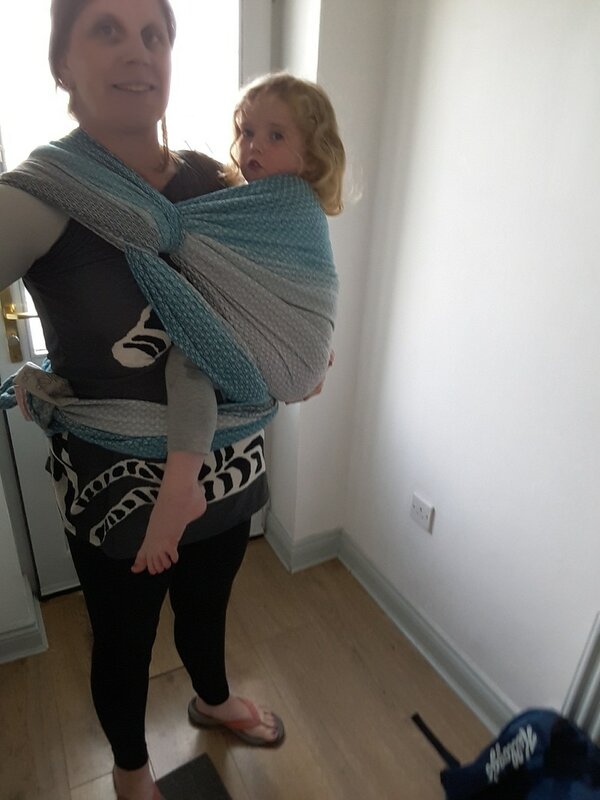 First impressions of the wrap were that it was so soft and I loved the colours; various blues on white weft with a gradient to grey with purple tones. I'm a sucker for blue so these colours really caught my eye. 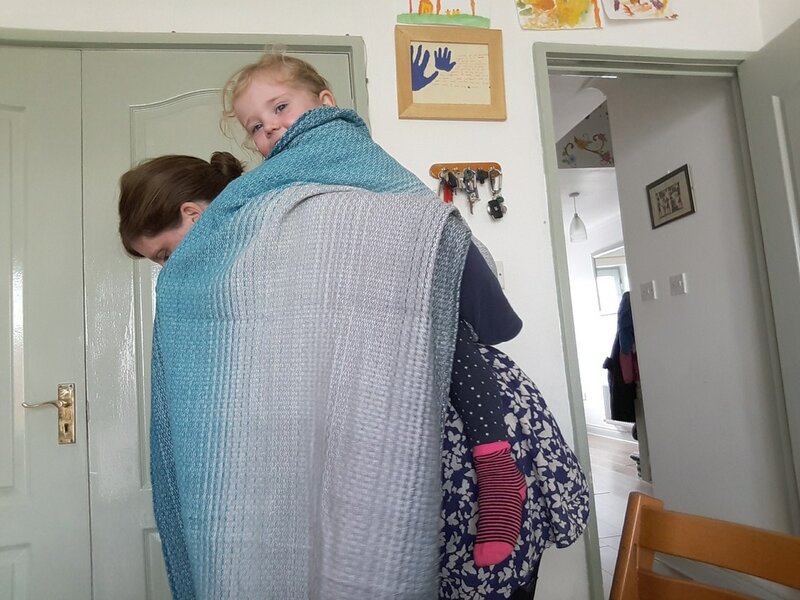 At 300gsm or grams per square meter, this wrap is on the heavier side and would definitely stand up to the weight of a large toddler/preschooler. 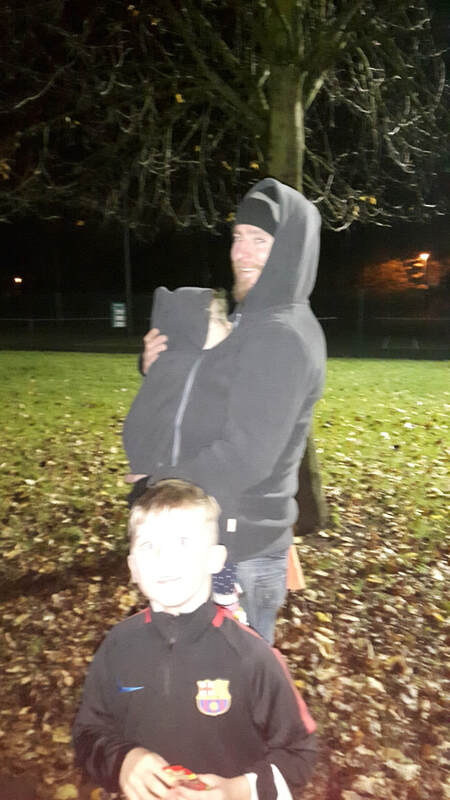 I had my 3.5yr old, 14.5kg daughter in a ruck and she felt very comfortable. With such a densely woven wrap there was no digging at the shoulders like I'd get with some lighter wraps when wearing a toddler. 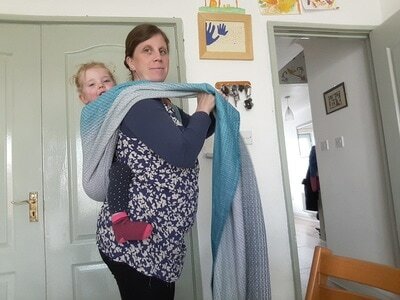 The wrap is marshmallow soft and cushy, like a favourite blanket and as I understand, it's like this from new. 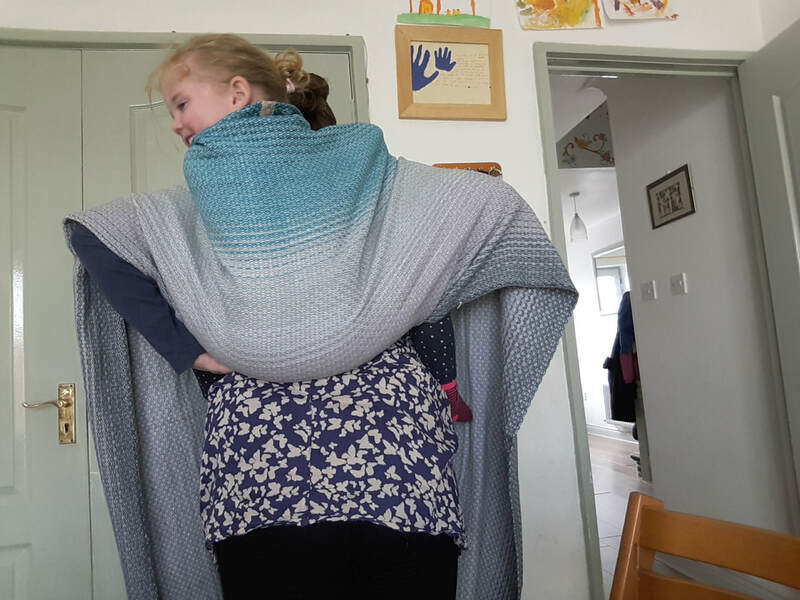 At 70cm wide and 470cm long or a Size 6, this size wrap is my perfect base size and would be perfect for trying out almost all carries. I had my trusty newborn demo doll in a Front Wrap Cross Carry (FWCC) and had a lovely chunky knot tied behind my back. 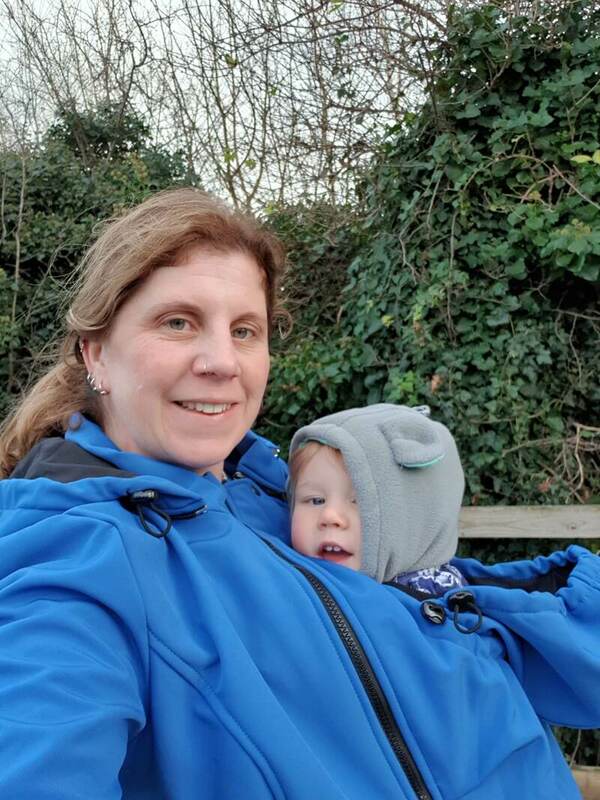 ​Due to the thickness of this wrap, a little extra attention to tightening strand by strand through the rails is needed but once tied, there's a lovely grip that will keep it all in place. 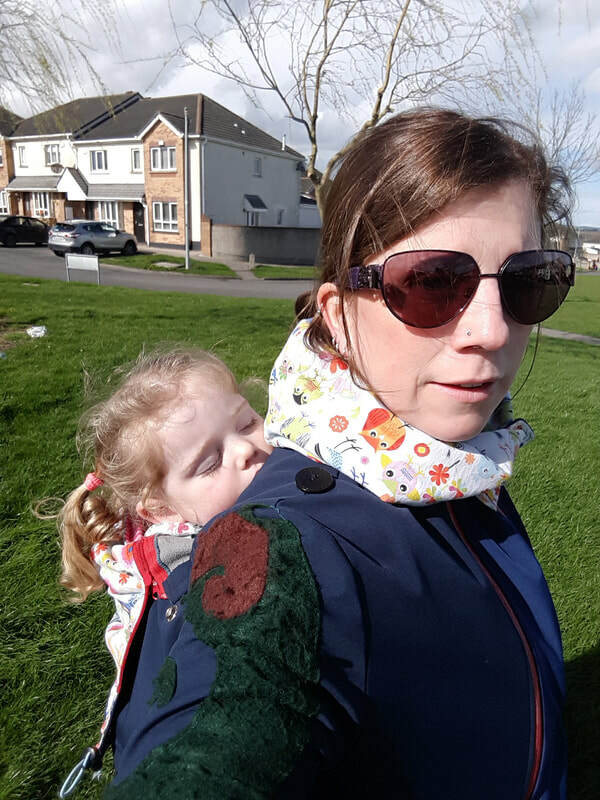 I really enjoyed carrying my 3.5yr old daughter (14.5kg) on my back in a Rucksack Carry. I'm 29wks pregnant in these photos and liked being able to finish tied tibetan so that I had no knots around my waist/stomach. 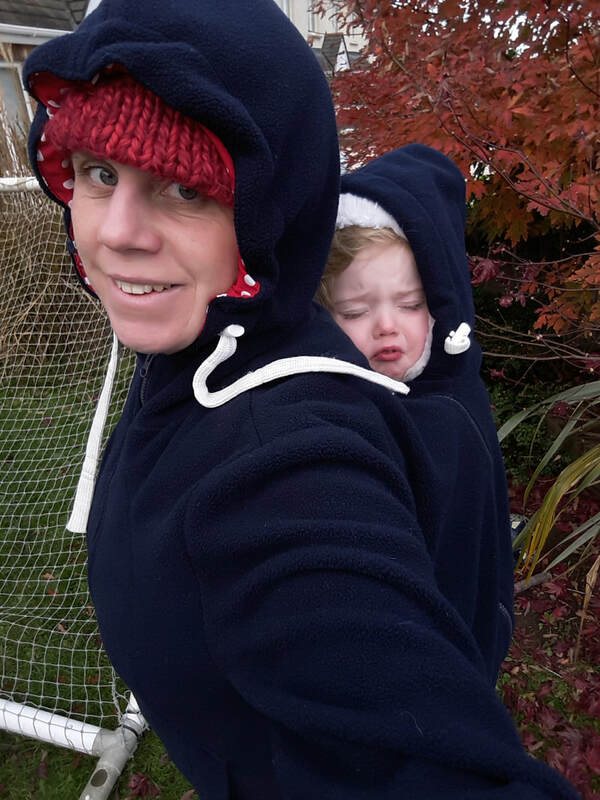 While a 14.5kg preschooler won't feel totally weightless, she was very comfortable on my back, there was a soft padded cushiness on my shoulders, thanks to the chunky wrap and her weight was distributed nicely across my shoulders and chest. 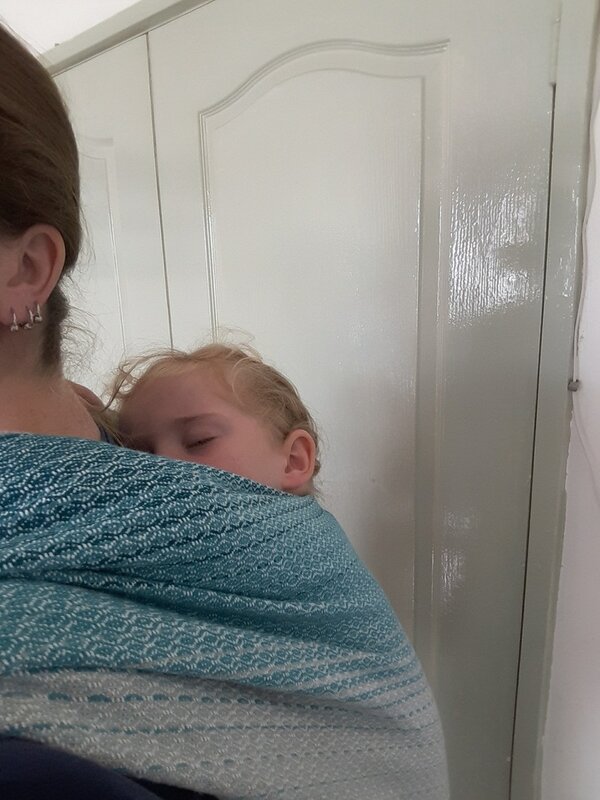 This wrap came loaded with sleepy dust as she was asleep before I had even finished wrapping! 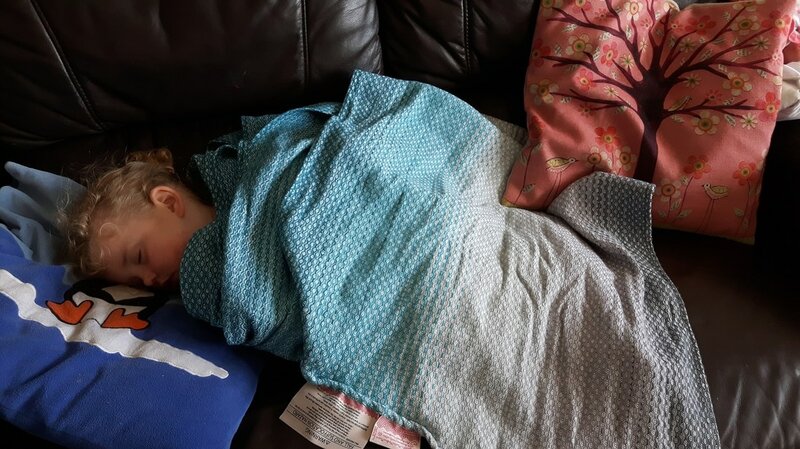 She was up for about 30 minutes when I transferred her to the couch and she was kept cosy for a snooze with the Madalo draped over her! 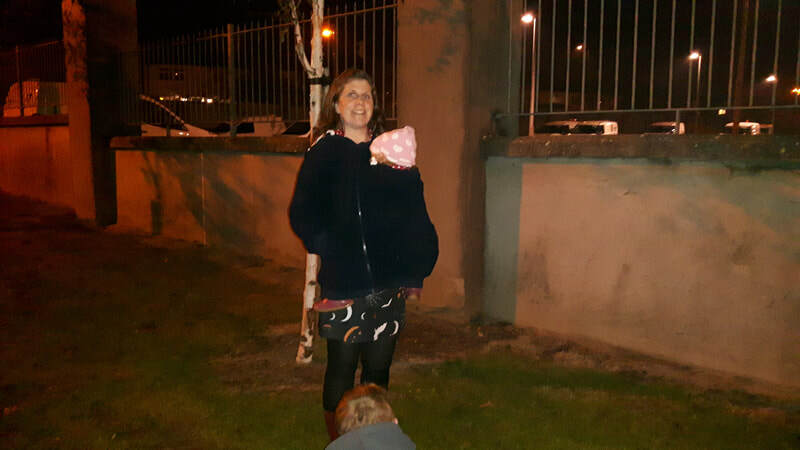 ​Thank you Madalo for sending your wrap travelling around Éire. I'm now sending it on to the next lucky participant to begin it's maiden voyage around Ireland! 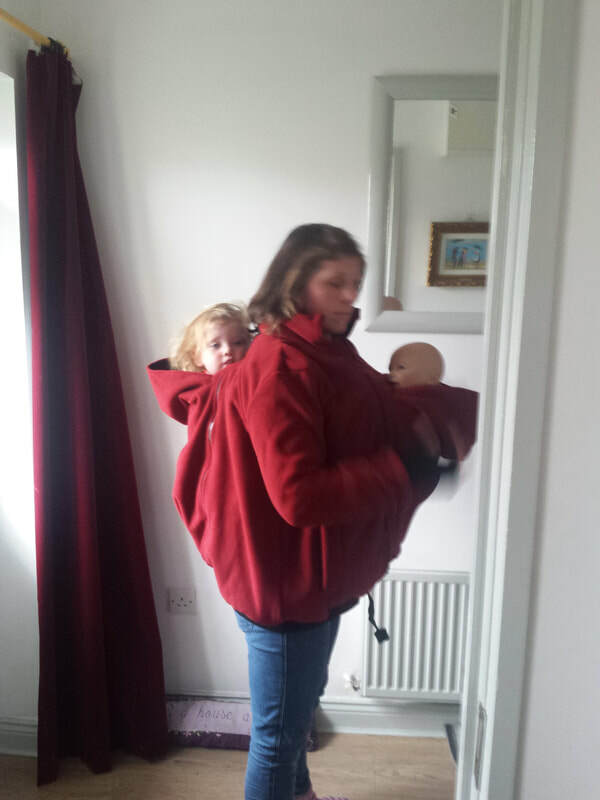 Look what's arrived at Leanbh Babywearing HQ. 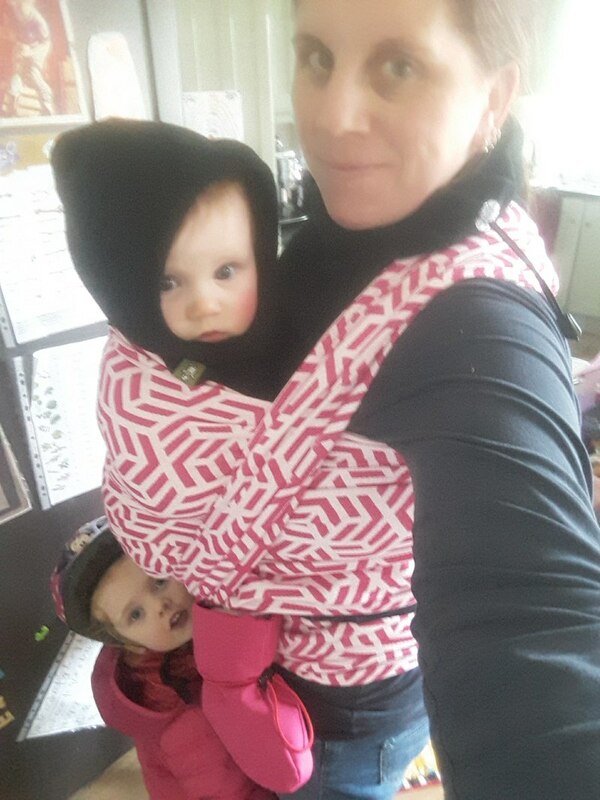 The new Tula Free To Grow Soft Structured Carrier! 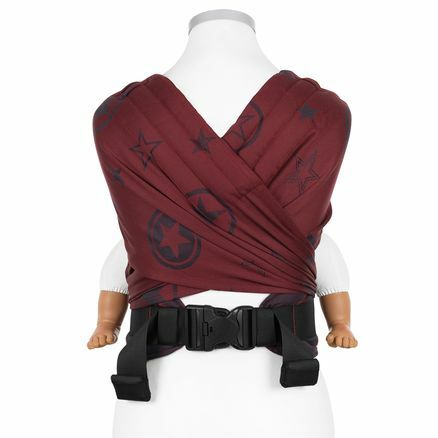 This carrier can be used from 7lb to 45lb and the body panel is adjustable in three width settings and two height settings allowing you to use this carrier from newborn without an infant insert. 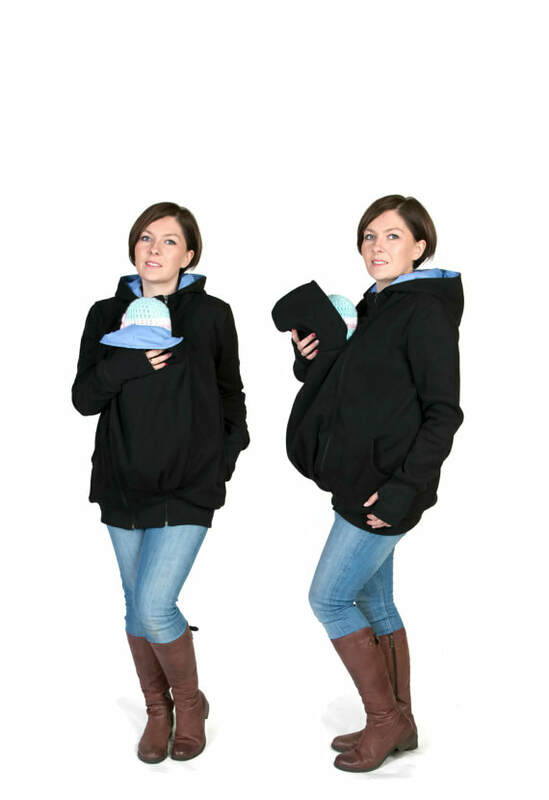 The carrier comes with a removable hood and can be used for front (parent facing) and back carries. 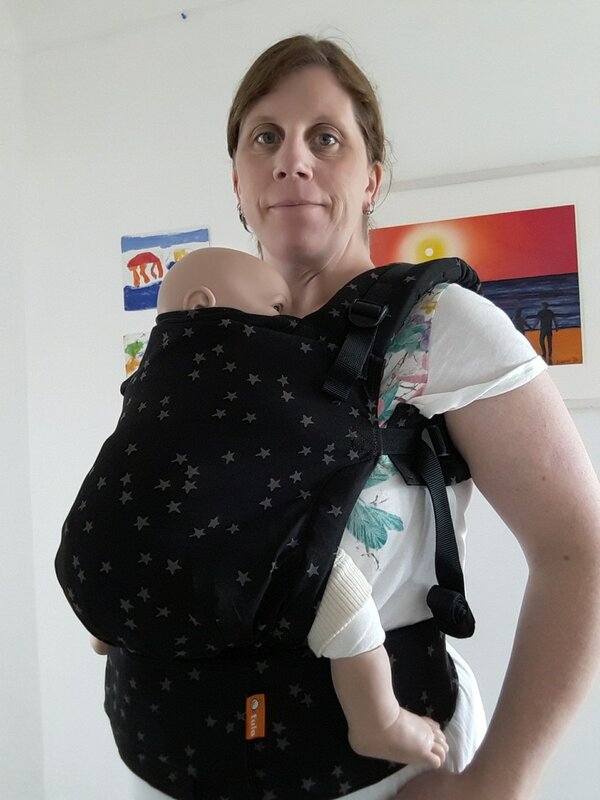 Padded shoulder straps and waistband offer lots of comfort and support for the wearer and there's even a handy pocket at the front of the waistband that could hold a phone or purse. So I tried out the Tula Free To Grow with my newborn doll, 4mth doll and toddler size doll. It was easy to adjust both the width and the height of the body panel. 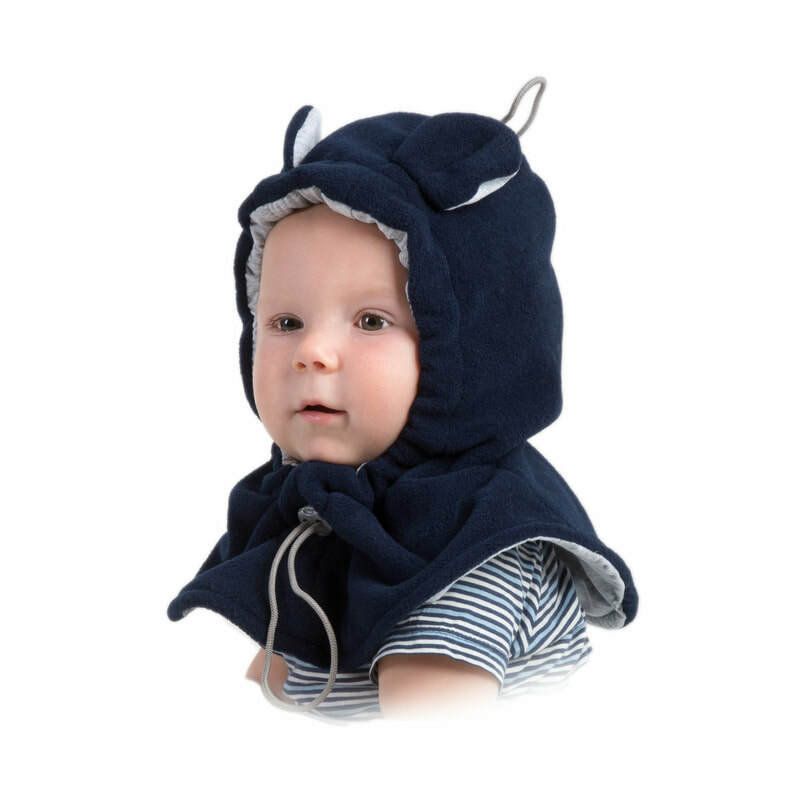 The hood is removable which is a very handy option to have. You can easily attach it with the hook and loop snap fasteners inside the body panel. The waistband extends to 140cm and the shoulder straps extend to 125cm so it will suit a wide range of wearers. 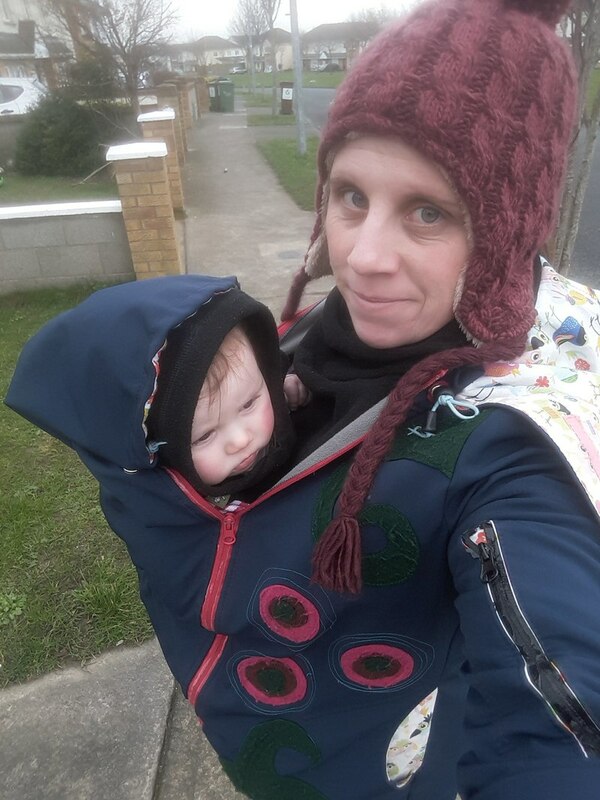 The shoulder straps are worn in rucksack style and are nicely padded to take the weight of an older child. 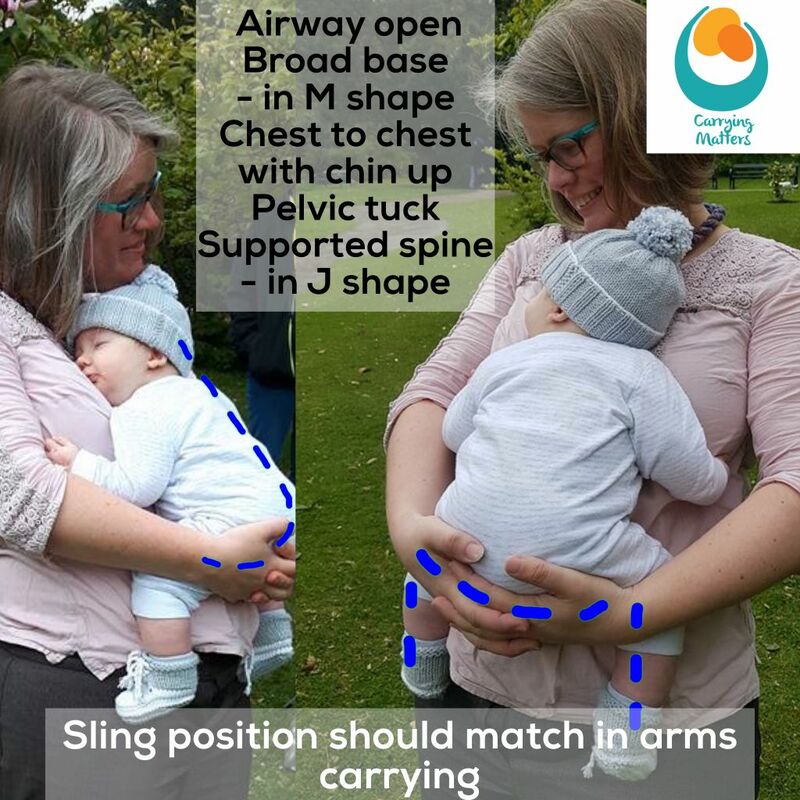 As there is no option to cross the shoulder straps, this also means that you cannot use this carrier for hip carries, which won't bother everyone but is something to consider. 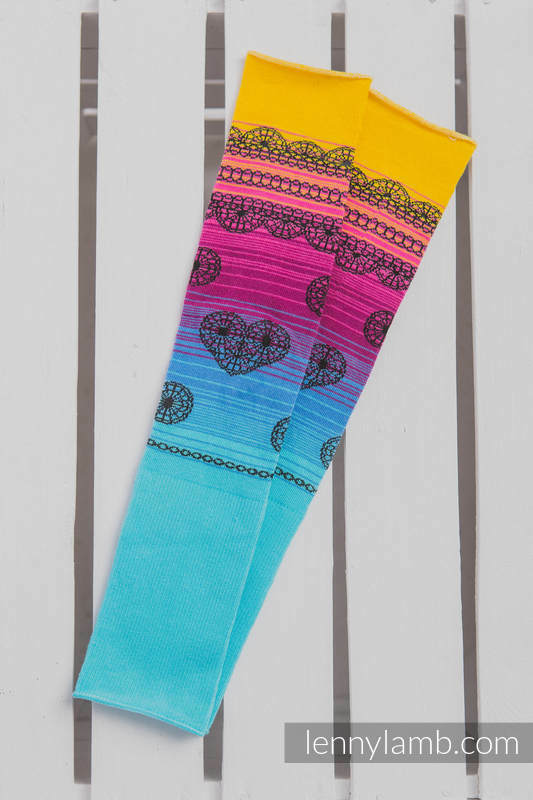 The waistband offers firm support and the handy pocket is placed on the front of the waistband for easy access. 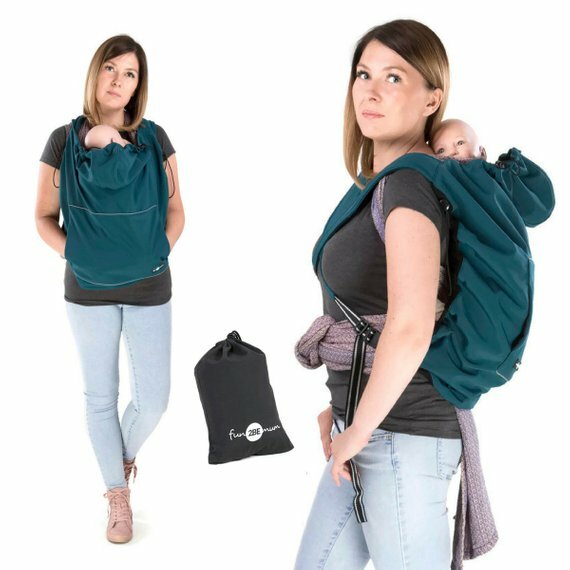 All in all, it's a great addition to the Tula family and is great to see another "from birth" SSC on the market that does not require an infant insert. 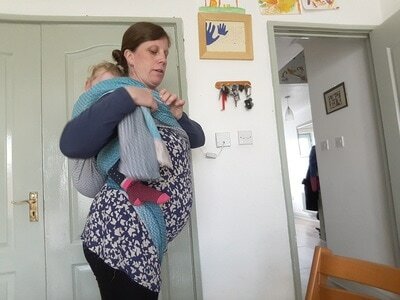 ​To try this sling out, check out the sling hire page for full info, T&C. Collection from Swords and nationwide postal hire also available.